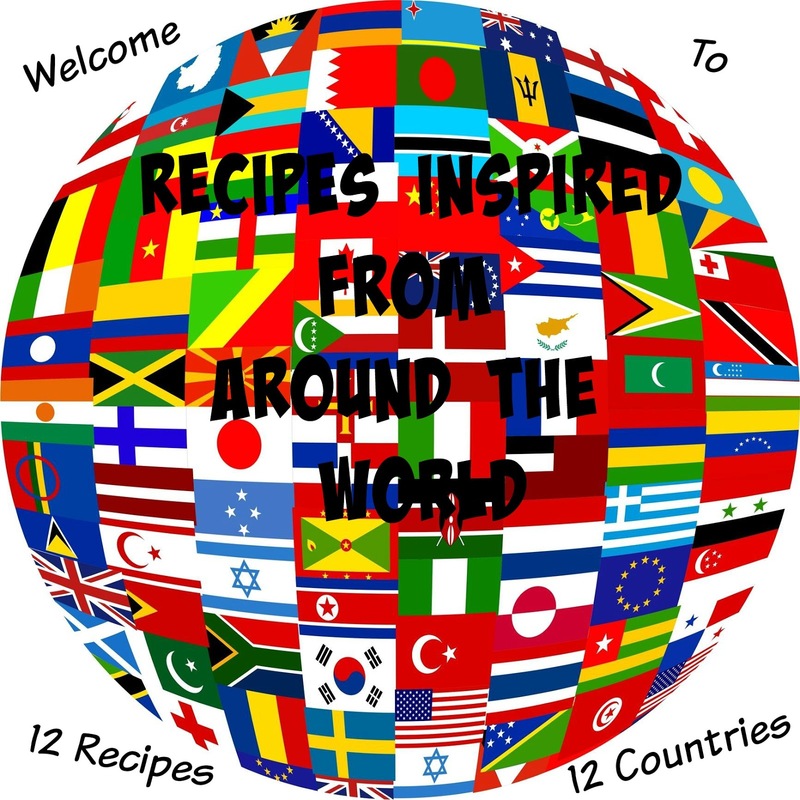 Recipes Inspired From Around the World. Culinary Adventures: France. French food, is one of the most iconic and recognizable of cuisines. 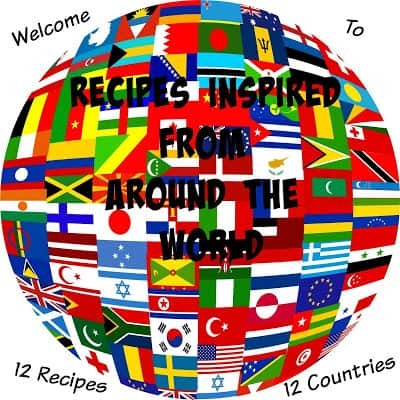 Everyone has their favorite French dish….Boeuf Bourguognon, Buche De Noel, Cake Le Prantome, Cheese Souffle, Crepes, Croissants, French Bread, French Onion Soup, Mousse, Omelette, Pates, Roasted Chicken, Salad Nicoise…and so much more. You can’t mention French Cooking without mentioning Julia Child, The French Chef. Julia Child brought French Cooking into our homes. We watched as she made French Cooking look easy and fun to prepare. She gave us, the at home viewers, the confidence we needed to tackle French Cooking. Julia Child also taught us about French Wines….and the importance of enjoying good food and good wine. Her cookbooks taught us and still “teach” us, “How to master French Cooking.” Julia Child was a pioneer in the genre of “Cooking Shows.” She made French Cooking look delicious, even in black and white! I have enjoyed watching her old cooking shows on you tube. Once again, after watching her shows, I feel that I can and will tackle French Cooking. Whisk together the flour and salt in a small bowl. Whisk together the eggs and sugar in a medium bowl until pale. Whisk in milk, water, orange juice, vanilla extract, and orange zest. Whisk in flour mixture until combined. Whisk in cooled melted butter. If the mixture is too thick, add a tablespoon or two of juice or water, until a thin consistency is achieved. Cover and refrigerate batter for 30 minutes. Heat an 8-inch crepe pan or skillet over medium heat for about 1 minute. Cover the surface with a small amount of oil, heat until it gets sizzling hot. Ladle some batter (1/4 cup or so) into the middle of the crepe pan or skillet. Immediately start swirling the pan to distribute the batter over the surface. Cook for 45 to 60 seconds or until light golden brown. Flip over and cook the other side for 20 seconds. Remove crepe to a plate and repeat with remaining batter and oil. 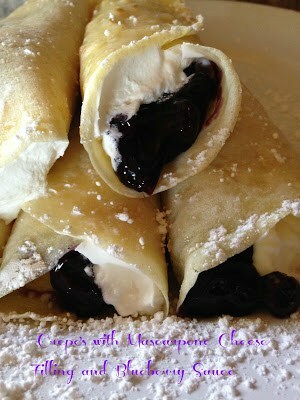 Fill crepes with Mascarpone Cream Filling and Top with Blueberry Sauce. Mascarpone cream filling is so delicious. It can be used as a filling in cheesecake and desserts. 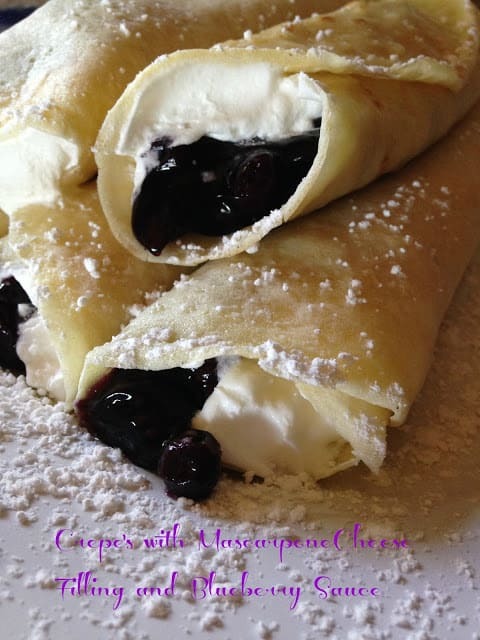 Blueberry sauce is delicious on crepes, pancakes, waffles, cheesecake and ice cream. In a saucepan over medium heat, combine blueberries, 1/4 cup water, juice and sugar. Stir gently and bring to a boil. In a small bowl, mix together the cornstarch and 1/4 cup cold water, gently stir into the blueberry mixture. Simmer gently until thick enough to coat the back of a metal spoon, about 3 to 4 minutes, remove from heat. Stir in almond extract and ground cinnamon. Serve warm.